The insurrection of the Lyonnais is remembered in its songs, of which La Ligue noire, the song of the Lyon Infantry, is the best known and (to judge from Youtube) the only one much performed today. I expect 18th-century soldiers could muster the drums if not the electric guitars! I haven't been able to find an English translation of the lyrics. Loosely, despite the forces ranged against them, the infantrymen will drink and fight and not give a f...; anyone who dies for la patrie and for liberty, will have lived enough. Widows must not tolerate the courtship of cowards, for a man who who trembles in battle is useless as a lover ("jean-foutre en amour") There will be no more peace until all the brigands of the world are dead at the feet of the Lyonnais. Under the leadership of Précy, they will be known from the Rhône to the Ganges as a band of brothers with Mars for their father. The Song of the Lyonnais Cavalry, which is similar in vein, has a nice little story to go with it. The composer was a mysterious cavalryman, known only as Petit-Frédéric, who seemed to have appeared in Lyon out of nowhere. He was, we are told, a small man of noble but undoubted military bearing, with an air of melancholy and an imperturbable sang-froid. A recent scar extended down one side of his face. Speculation had it that he was a Swiss Guard in disguise or an agent of the emigré court. In the early days of the siege he was seen in long conversation with Précy in the vestibule of the Hôtel de Ville; the general offered him a lieutenancy his privileged personal regiment but he preferred to serve as a simple soldier. On the night which Frédéric composed his song, his detachment found themselves defending the advanced post in Les Tupiniers-Grézieu. Dubois-Crancé's troops charged twice and were twice repulsed by the Lyonnais bayonets and by fire from the battery of four canons. On third advance, they were about to dismantle the battery, when the Lyonnais infantry engaged their flank and allowed the cavalry to charge, pistols and sabres in hand and turn back the enemy column. Following the action, the night was tranquil; the Republican campfires could be seen in the distance and the cries of their sentries could be heard, along with snatches of song. Frédéric did not sleep but instead set himself the task of composing a warsong as beautiful and consoling as the strains of the Marseillaise which could be heard drifting from the the enemy camp. He had no knowledge of music but a tumpeter took down the tune which he composed. Alphonse Balleydier, Histoire politique et militaire du peuple de Lyon pendant la Révolution ...vol.1 (1845), p.377-83. The memoirs of Antoine Delandine capture the note of resigned bravado which existed among the prisoners of Lyon awaiting the verdict of the implacable Commission Révolution. Those sentenced to detention in particular wiled away the time with songs and charades, and bouts, rimés, and enigmas. The English traveller Anne Plumptre translated several, including the song which Delandine himself composed, "Le bateau" . It is a sentimental little piece, counselling the patriot to quiet acceptance of his storm-tossed fate. Cheerly, my friends, in prison pent! Each patriot will sustain his woes. Calm let us wait our last distress. The insurgents by no means had the monopoly on songs. The Commission Temporaire orchestrated a whole calendar of Revolutionary celebrations and ordered "civic hymns" to be printed and distributed to their "brothers the sans-culottes". 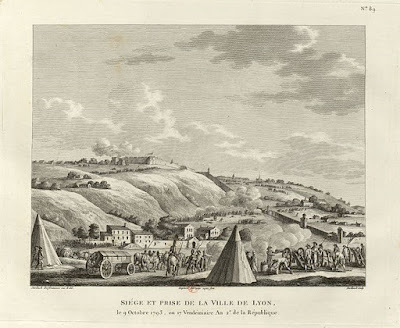 To arms, Citizens, all of us: up to its very name/ Swear, swear to annihilate infamous Lyon. The Monument des Brotteaux - place of memory? Lyon - the Revolution in pictures cont. Saint-Just - Angel of Death?